The U.S. National Team forward talks about how information is power, self-care is key, and how negotiation can be collaborative. 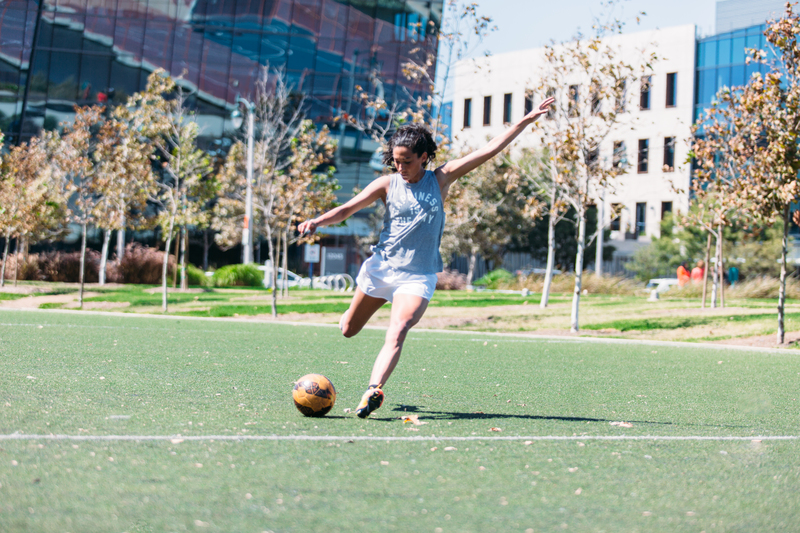 We talked to forward Christen Press about the preparation stage of negotiating, something that she says thrives on. The Stanford University grad and overall lover of learning talks about the keys to being well-prepared for tough negotiations, and that includes learning to have fun with the process. LUNA BAR: Why do you think preparation is important in negotiating? CHRISTEN: Talking about the ‘prepare’ stage is a great one for me because I love being prepared. Information is power. Preparing looks like taking time to get things right without rush. Preparation looks like getting the proper resources and help to set yourself up for success. Preparing looks like research and studying and learning and growing. LUNA: Can you talk a little more about how information is power? CHRISTEN: The best thing to do in a negotiation is to not be afraid. What you don’t know is always scary. The more you know, the less you’ll be afraid. A lot of people ignore the counter arguments and focus on their own points. Good preparation is finding the holes in your own argument. If you’re aware of the flaws, and you’re already prepared to counter the counter, you don’t have to ever be afraid of what might come up. LUNA: What is something you’ve learned in what makes successful negotiating? Maybe something that makes you, in particular, good at it? CHRISTEN: Be empathetic to the other side. You might be worlds apart on what you want in a deal, but you can connect on a human-level. Instead of focusing solely on your own argument, there is value in thoughtfulness and analysis of the other side. When you are going to present a fact, look critically at the fact from its counter argument. Try to understand what the other side wants. I find it important to remember that life has put us all in different starting positions. But instead of being angry, understand that the other party might only see things a certain way but that they’ve only had access to these certain life experiences. The same is true for your side, so I try to be thoughtful about the fact that life has given us all biases, and that mindset makes me open and compassionate. LUNA: How can someone prepare to avoid becoming angry? CHRISTEN: People get angry about ignorance and when the other side doesn’t agree. I personally don’t feel that, I feel compassion. Just on a human level, we are all complicated; we are all complex. I view the people working with me and on the other side of the negotiation table as complete humans. And I hope that helps others to see me that same way. Everyone should be treated with respect. Don’t respond to negativity with negativity. That’s no way to create change. In order to prepare? I think just always practicing compassion and respectful treatment in your every day life. LUNA: How did you find the time to do the preparations? It seems almost like a second job. CHRISTEN: It is kind of like a second job. You can work your normal job, and then there’s a separate part of your work that you have to do to fight for your worth. For me, I view it as if: I have my job on the field and I have my job off the field. Finding the balance of being able to do both knowing that both can be exhausting, but both are essential to my career. And the work pulls from different wells of energy. It’s balanced. LUNA: How do you maintain sanity through all of it? CHRISTEN: My personal philosophy is that you should always have strategies for maintaining balance in your life so that any influx in work or environment doesn’t impact you. I have a very robust self-care strategy – including twice daily meditation. No matter the external pressures, I rely on my routine, my confidence, and my self-care. I never compromise those things, and in the end I find there seems to be plenty of time for everything. LUNA: Is there anything you’ve learned that you'd do differently moving forward with preparations for future negotiations? CHRISTEN: I’m super analytical and super empathetic, and I have to balance that with being efficient and decisive. You’re never going to have a perfect solution or perfect answer. I tend to feel like I have to reach perfection, the perfect compromise. I think sometimes I have to be more accepting. I have to realize that other people have different ways of finding solutions and be less controlling. LUNA: Any other tips based on what you’ve learned? CHRISTEN: I’ve learned that negotiations can be really fun. The word “negotiation” is off-putting, you might have a perception of it being scary, vulnerable, awkward. But think about what you can do for yourself to make it energizing and exciting. Make it a collaboration. Part of that is picking the right people to work and support you. But part of that for me is that the study and understanding of people is interesting. In the beginning, I sometimes say nothing, and then start to learn what people react to. It’s almost a study of psychology, and taking those little pieces of information and being masterful with how we speak.